There are some other paper i will sen dyou the link. Rgearding the relationship between autism and number of triradius is very interesting research. However the siginificant effect needs to be to understood more samples need to be given for a precise conclusion. since the population size is small it would be difficult to find a proper correlation. There is lot more to think on this. But iam trying to find out on the importance of the interdigital loops does it add some value to the autism. The other thingh which seems to be interesting is that if people say genes have an effect on patterns of fingerprint formation such as loops, whorls then why there is a sigfinifcant variation of these patterns within a large family. Iam trying to look at whether there is factor responsible for finger pritn formation on fingers based on genetics or is it related to somethingh it looks like genetic play a role but how much. In a similar way there is also formation of palmar loops(interdigital) is that related to genes or somethingh else. This has to be clear, unless more data is collected can precise conclusion be made. The important thingh is when you associate finger with fingerpritns then there could be corruption in data because finger would be more related to genetics than prints, however the effect of finger shape, palm shape can have effect on prints hence when looking at these data such as ridge count ect there could be effect of genetics coming into play and therby conclusion could be that fingerpritns are affected by genetics, so in this case how do you look at dermatpoglyhphics indpenedently, what kind of measure shoudl be used to correctly say this is a measure independent of finger shape, finger length ect.. if i undersatnd this clearly then answers whether fingerprints, palmpritns are affected by genes can be concluded. I appreciate your 'philosophical' thought about how fingerlength & fingerprints could interact. But I am not aware that any study has indicated that fingerprints characteristics correlate somehow with finger length. And actually... I think quite some of your thought go far beyond the initial topic that you described at the beginning of this discussion: the interactions of fingerprints & palmar dermatoglyphics. Are you sure that you would like to 'mix' all these individual topics in one discussion...? Sorry, I am not sure that I understand in which direction your thougths are going... maybe it would become helpful for me to understand your aim with this discussion if you specify your motive to initiate this discussion. And I am wondering, do you have any specified questions that you would like to see answered? I think probably i should be better categorize and organize thge questions better i guess that is wheer the confusion is. 1) Iam trying to do some reserach independently on trying to understand what factors affect fingerprint and palmar prints formation and their function. If the same the factors affect the finger and palmar prints formation then definitely there would be interaction since the same factors which affect finger prints also affects palmar prints. 2) If anybody is to create a complete model for dermatoglyphics what would it encompass. 3) The idea is that can a scientific model be created thereby helping palmistry in a better way. 4) What is the purpose of palmar prints in terms of palmistry (I do know skin ridges are used for gripping, but my concern is what does the palmar prints in realtion to palmistry, like fingerprints has importance in palmistry, but iam not sure about palmar prints). if so then how would it be combined with the fingerprints. Please let me know, i can create a seperate title for these topics and accordingly continue the discussion. I will send some more papers a little bit later. Genetics and environment during development are important factors in the resulting fingerprint pattern. The shape of the volar pads and the timing of the swelling and deflating of the volar pads is strongly influenced by genetics. The volar pads are on the fingertips and areas of the palms. Environmental factors interact with the genetic instructions that affect the 'speed, order and timing' of developmental aspects. Speed relates to how fast or slow various processes happen. There is a typical sequence to these factors and then there's the normal timing. An example to think about (relating to speed, order and timing) is the cleft lip and palate. The cleft lip is 'normal' at a certain stage of development. If the development is stunted the lip doesn't continue to form normally. Thanks for the answer. It looks like environment and genetics do play a role which affect volar pad formation and hence finger and palmar prints. So the same variable of volar pad and enviroment should affect palmar print pattern therefore in such a case we cannot split palmar and finger patterns or prints and look at it seperately therfore we have to look at palmar and fingerpattern together since the varaibles which affect the formation would be the same. therefore we have to combine palmar and finger prints. Can you tell what purpose palmar pritns are, especially interdigital loops do these indicate somethingh. I will upload a paper by penrose on how finger ridges are formed i will send it on monday. do these interdigital loops have some purpose or what does it indicate in terms of palmistry and behavior. I do know stalin mentioned something based on indian palmistry, but i would like to know from the western point of view and modern hand reading front. I would appreciate your answer. Can you tell what purpose palmar pritns are, especially interdigital loops do these indicate somethingh. My thought would be that they serve the same purpose all ridges do. That would be for tactile and friction purposes. My theory as to the purpose of interdigital loops would relate to expansion and individual movement of the fingers, but it would also strongly relate to the topography of the palms. The volar pads are between the fingers, not the so called mount territories designated to the areas under the fingers. Thanks for your help, i have to read the paper in detail, the way i ihave understodd from the paper is that it look likje palmar pattern might not have an effect on hypertension or high blood pressure, but fingerprint pattern depending upon male and female plays a role in having an effect on hypertension. so still there is mystery in reference to palmar pattern, but what they have mentioned they have found some relation between decrease in a-b ridge count which correlates to increase in hypertension, so it looks like people who have raja loop might have lesser chances of BP if other fingerprint pattern are in accordnace to the observation made by the disserttaion work. Looks like good work done. So the way i have understood about palmar patterns and fingerprint pattern is that there is relvance to medical work, but in refernce to palmistry does it imply somethingh, like people mention in websites that a person have loop of humor has such and such quality, a person haveing raja loop has such and such quality, how far is this observation true. Like there is some website (i forgot her name she has mentioned palmar pattern are permanent personality, ofcourse details are not mentioned), so iam confused when i read this and this part. I will send you the other paper tommorrow. Here you go for the links which i had promised to send you all. The article title is development of epidermal ridges, when you click on the link it will ask for download and also it shows all files in imaqge format once you go to the link. otherwise you can download the pdf file acordinlgy by clickin gon the top left corner. Hi Anand! Thank you! I didn't have the Penrose paper but did have the paper from the second link already in my collection. I do appreciate you sharing these with us! or Is there a possibilty that palmar prints (Loops on various mounts) should be analysed differently from fingerprints and but should have seperate purpose. Iam not sure, but just a thought. I would appreciate if you can provide valuable inputs based on your knowledge and experience. I just came across this information in "Finger Prints, Palms & Soles" that you may find helpful. It is a very interesting article you have pointed out, there is an interesting observation he has made one which mentions is that there is negative correlation on the hypothenar/thenar region of toe and palm. There is an an interesting article by siemens it might be handy to you since you seem to have interest in this area. Here you go. One important thingh is main line index which is very crucial. of course these papers have been based on categorizing a group but i would say if you start treating every hand as one then you undersatnd the hand better. There is an older paper than the one which i mentioned, probably written by cummins on dermatoglyphics which is mentioned as a reference in the current paper. 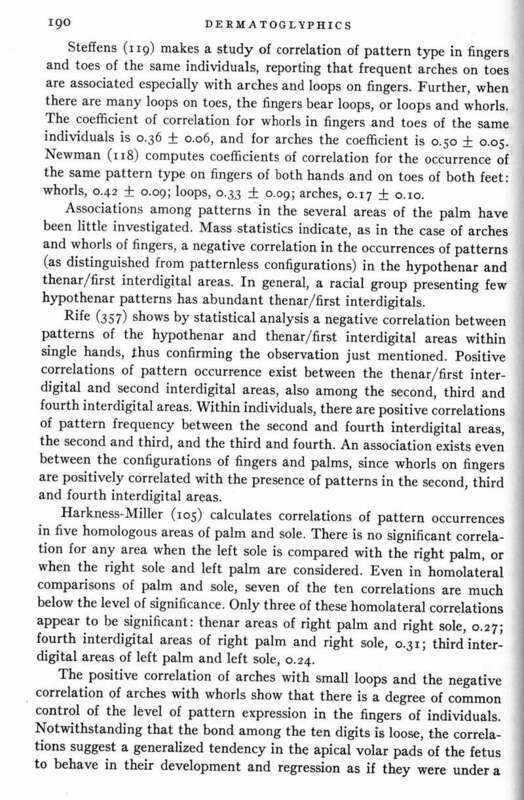 Also if you look historically about francis galton was trying to identify racial charecterstic using fingerprints he could not identify, he forgot about palmar print. Iam not sure whether any conclusive evidence can be pointed about a group, however there seems to be correlation but how far is it siginifcant would need more data point, even in the paper which is mentioned there is not an even data set for comparison, but definetly his summary may give some insights.